To begin with, we’re all guilty of running on auto-pilot from time to time, especially at work. You get caught up in the daily routine of small details, and not so small details, that go into working at an office. Detail checking needs to be improved, more files need to be scanned, get the credit card machine fully functional, and discover why the picture taking apparatus works on a sporadic basis while making appointments, setting up new patients, updating returns, blah, blah, blah….you know, work. Then something stops you short in your tracks to remind you why you’re doing this. And that happened on Thursday, July 30. Our last patient. * She was running late and we’d had a slow day. You know the situation. When she came in I thought she looked familiar. I took care of her input information and noticed the picture we had of her from last year. Did not look like the same woman; haggard, tired and sick. This year, she wore make-up, had done her hair and looked good. I checked some details and found out last year, she was going through chemo, wore a handkerchief over what was probably a bald pate at the time and she had stage IV lung cancer. I checked again. Stage IV? I have included a link to the American Lung Association so you may read for yourself the grim survivability rates are at this point. I have known people with lung cancer, and I’ve known for quite some time that lung cancer, usually because of when it’s detected, is fatal. And it’s fast. Technically, the patient shouldn’t have been here, but against all odds, she was. And even looking healthy. When her visit with the doctor was over, I had to speak with her and her caregiver/daughter. They came out all smiles and I had their recommendations printed up. I told her how happy we were to see that she was here and what a great thing this was. Her daughter described the desperate days of last year when she didn’t think her mother would make it and how she became very aggressive with the cannabis oil treatment. And here she was, downgraded to Stage I lung cancer. 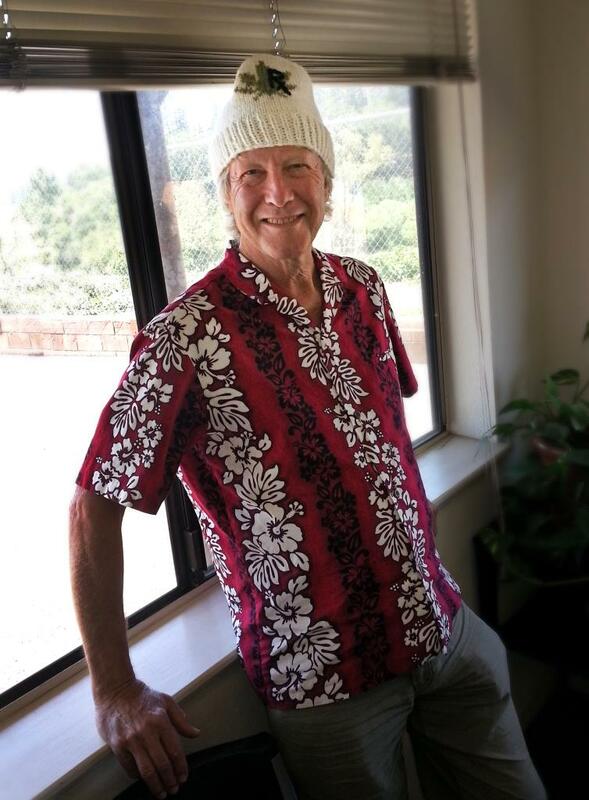 As the details unfolded, I thought of my Uncle Bill who died recently, and how studies in the specific brain tumor type he had showed great results when treated very aggressively with the cannabinoids found in marijuana. Unfortunately, he’d been in Tennessee when this happened, and the doctors he and his immediate family consulted were concentrating only on traditional methods. What a waste. Then I looked at the patient in front of me, happy and given a fighting chance at living out the rest of her life without the immediate threat of cancer looming over her. I ducked my head, wiped at my eye and murmured something about having to print up something(yes, just like that), while my co-worker, Wendy, was openly crying, dabbing at her eyes with a kleenex. Did the marijuana help or was the patient going to improve anyway with the chemo? I don’t know. I related this story to my general practitioner and his tone was very neutral when he said that was really unusual. I understood his position. Doctors in California have to be careful about their stance on marijuana; it’s not covered under any insurance, the federal government does not recognize its legality here or in other states and they have to consider the general consensus of what their patients think of it. Most doctors with a private practice can’t afford to jeopardize their standing in the community, medical or otherwise. But think about it: A plant that has medicinal qualities, never caused a death from overdose, and even has the venerable AMA wanting to do clinical studies and the federal government has it classified as a Schedule 1 controlled substance. I know, I know, I think I’ve talked about this before and until the issue is resolved, I’ll probably talk about it again. When you have a documented case of stage IV lung cancer being reversed in an elderly patient, wouldn’t you want to how much of this was the traditional medicine, how much was the marijuana, how much was genetics? So why is the government dragging their feet? How many more people have to die? And WHY? Inhale deeply. Hold for 10 seconds. Exhale. an umbrella. The stories I’ve heard from some of the patients about their experiences at other clinics are appalling. Patients packed in tiny waiting rooms, overworked staff and a quick how-de-do with the doctor. No real information is given and definitely no rapport is gained with the individuals. The three of us who work up front definitely try to make the experience go smoother, and the doctor who works here is in it for the right reasons, as far as I’m concerned. He is a favorite for many around here and wherever he works, they’ll follow. Using the duplicate stitch was the only option here! aside my shrug (yes, I’m still stuck in the monotony of knitting 46 inches of pure stockinette!) 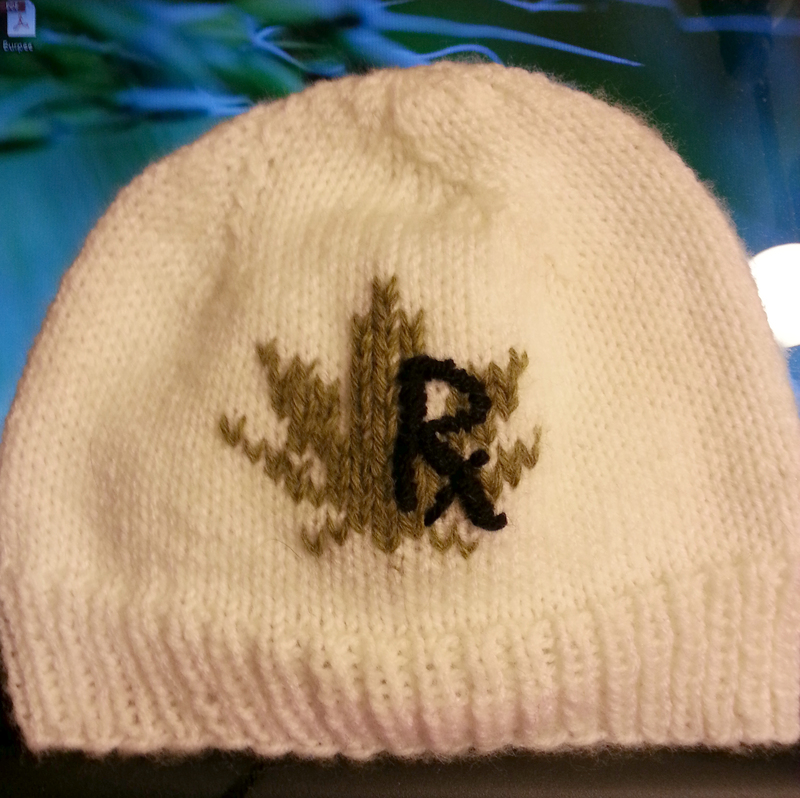 and quickly whipped up a hat. I tried to make the leaf look realistic, but in the end, I freehanded the Rx to leave no doubt as to what kind of plant was being depicted. It took me awhile to get the plant graphic down, as I used an image of a real leaf. Nature is not symmetric! He accepted the gift with aplomb and said that definitely, he would wear it when he went skiing. And no, it didn’t escape my attention that I was giving him a knit beanie on the hottest day of the year. Oh, well. *Patient names not used to protect identity.